On Thursday 10th November we headed out to Mt Clare (approx. 8 kms by car west of Walpole). Our hike was going to take us to the top of Mt Clare and then to the pedestrian suspension bridge crossing the Deep river on the Bibbulmun Track before heading back to the car park. An overall distance of 4.5kms and takes 1 to 2 hrs. The climb to the top of Mt Clare wasn’t strenuous; so we were surprised when we stopped past the hut on the Bibbulmun Track and read the log book which had many entries regarding the difficult climb. We soon found out why… as we descended down towards the river valley on a narrow winding and very steep track; carrying a fully loaded backpack up this wouldn’t be easy! The Suspension Bridge is the access point to Nuyts Wilderness and there are some longer hikes to Aldridge Cove, Hush Hush Beach and Thompson Cove; we will be back to do these in the future. After reaching the Suspension bridge we retraced our steps to Tinglewood Drive and turned right (Easterly direction) for 1km then left into a DEC access only track. Staying on this track all the way to the car; approx. 1km but all up hill. 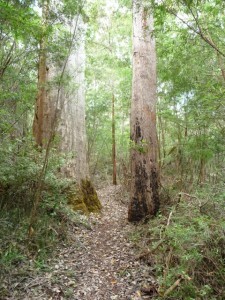 The trees surrounding the peak of Mt Clare restrict the view but the rest of the track was well worth doing.